upcycled furniture to bicycle and jewellery repairs. 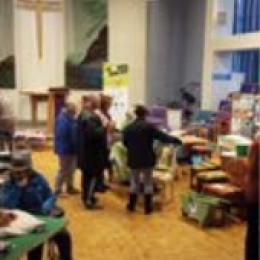 Our Upcycle and Repair Fair in 2019 will be on Saturday 18th May. Please join this group if you’d like to fix with us. You don’t need to be a St Luke’s member, or indeed have any church affiliation. St Luke’s Church is three quarters of a mile from St Albans City Station, served by frequent Thameslink trains from St Pancras. The No 84 bus passes the church on its route between the City Centre, St Albans City Station and New Barnet Station, running roughly every 20 minutes. If you are driving you can park (discretely) in the residential roads around. If you’re unfamiliar with the area, for easy navigation you could try Barncroft Way, from which there is a short footpath through to Cell Barnes Lane close to the church.